The North American woodpeckers known as "flickers" stand out for their distinctive wing and tail feathers of bright reds or yellows, and for their rampant interbreeding where these birds of different colors meet in the Great Plains. Despite the obvious visual differences between the Red-shafted Flicker of the west and the Yellow-shafted Flicker of the east, scientists have never before found genetic differences between them. A new study from The Auk: Ornithological Advances uses data from thousands of regions across the genome to distinguish these birds molecularly for the first time. Stepfanie Aguillon and her colleagues at the Cornell Lab of Ornithology explored patterns across the genomes of these birds and find them to be incredibly similar at the molecular level. 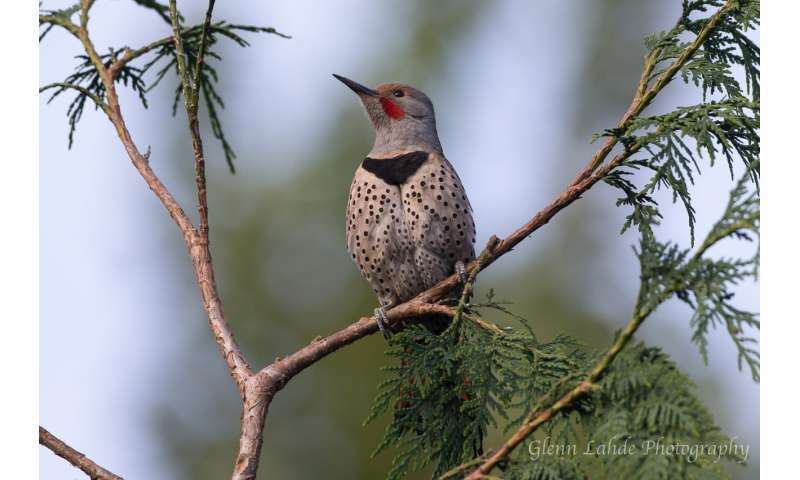 In spite of the strong similarity, they still have the ability to distinguish the western Red-shafted Flickers from the eastern Yellow-shafted Flickers for the first time through the use of new genomic methods. Genomic technology is advancing at such a rapid rate that genetic sequence differences that were undetectable in the 1980s using (then) cutting-edge methods are now readily apparent using next-generation sequencing techniques. "Flickers have intrigued ornithologists and naturalists at least as far back as Audubon, but only recently has it become possible to understand these birds genomically," says lead author Stepfanie Aguillon. "I was unsure what we would find, given how much trouble previous researchers have had with these birds. I was surprised—and excited—by how similar we found them to be since we now had thousands of markers across the genome. I think this paper underlies a theme that has become more and more apparent over the last few years—even when two birds look very different, they may not be very different genetically." "The hybrid zone between the yellow- and red-shafted flickers is particularly striking, but despite very apparent morphological and ecological differences, genetic studies beginning in the late 1980s found few differences between these two 'subspecies,'" adds flicker expert William S. Moore, a Wayne State University professor who was not involved with this research. "Hybrid zones are often described as "natural laboratories" for studies on speciation. Despite the low level of genetic divergence across the flicker hybrid zone, it is certain that selection is operating on genes involved in plumage divergence and ecological adaptation. Aguillon's study will be a foundation stone for studies that identify the adapted genes and will bring us to a new understanding of the processes of speciation."